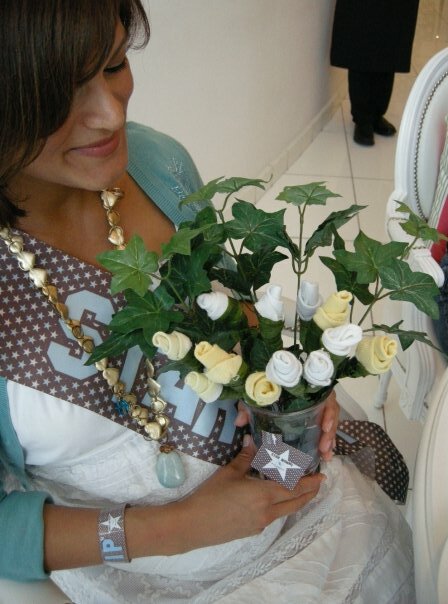 This precious bouquet of baby shower roses was made by Faaizah, who sent us this picture from halfway around the world!! Faaizah is from Dubai, which is in the United Arab Emirates and we are so excited and so fortunate to share her beautiful baby sock rose picture with all of our readers. Faaizah made her roses from baby socks using these instructions - and her bouquet turned out absolutely gorgeous! On behalf of all our readers, Thank you Faaizah for sharing your creativity with all of us! Would love to send you a pic of the roses i made with baby socks! Your demo/ pics were perfect!!! Please let me know where to send the picture! What a lovely bouquet of baby sock roses! Thanks again Faaizah! !